10 medium sized red, thick skinned potatoes. Peel and chop into quarters (or smaller) the potatoes. Place the wedged potatoes in a zip-lock bag with the oil and dry ingredients. Leave in the fridge to absorb the flavours for as long as possible. Place on a large flat baking tray, lined with parchment paper. The potatoes should not be stacked up on top of one another, they need to be spaced out so they cook evenly. 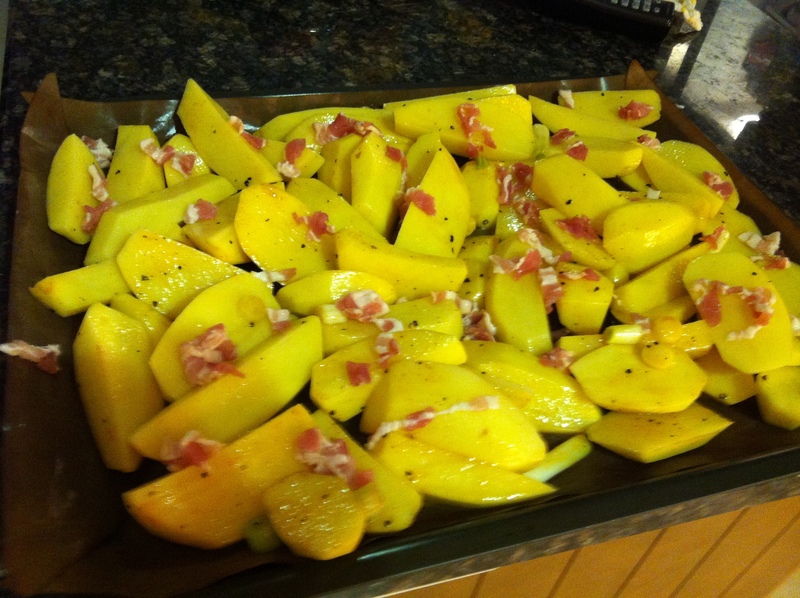 So they don’t burn, Half way through cooking add your raw chopped up bacon and sprinkle them over the potatoes. Leave for another 20 minutes, or until they becom crisp and golden. 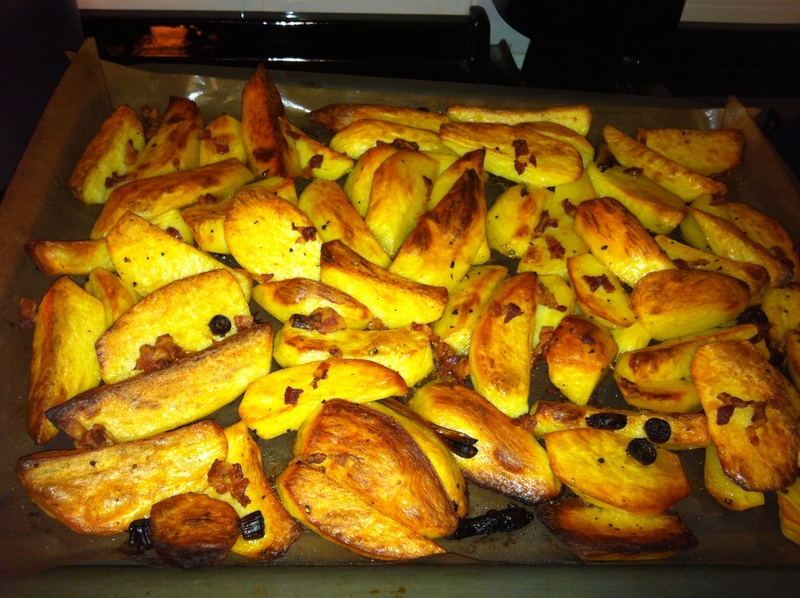 The edges of the potatoes usually will start to burn. There you go, fluffy, crisp tasty wedges. For the strawberry filling, strawberries in a blender or food processor with the sugar and blend well. Transfer the strawberries to a bowl and add the Marsala and chill in the fridge. For the sponge, preheat the oven to 190C/375F/Gas 5. 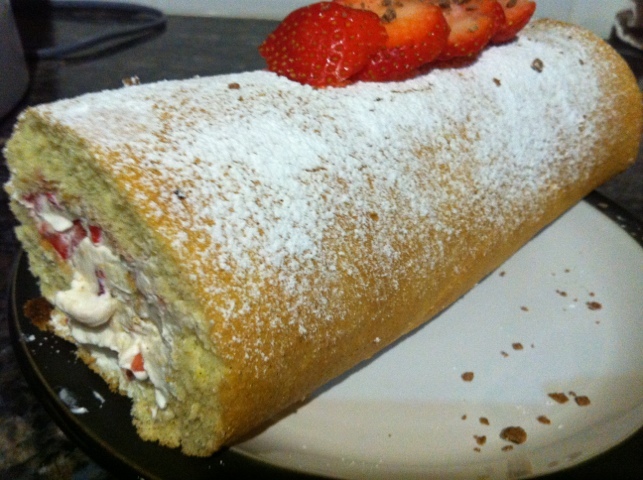 Grease and line a 23 x 33cm/9in x 13in Swiss roll tin or small roasting tin with greaseproof paper. Beat the eggs, sugar and vanilla in large bowl with an electric whisk until the mixture is very pale and foamy. Add the water with a metal spoon, which prevents the Roll from cracking when you roll it later. Pour the mixture into the prepared tin and level it gently the back of a large spoon. Bake in the oven for 10–15 touch. Remove the sponge from the oven and turn the cake out onto a sheet of baking paper and Leave to cool for 10 minutes, then gently peel the lining paper off the sponge and leave to cool completely. Meanwhile, for the cream, mix all of the ingredients together in a large bowl. 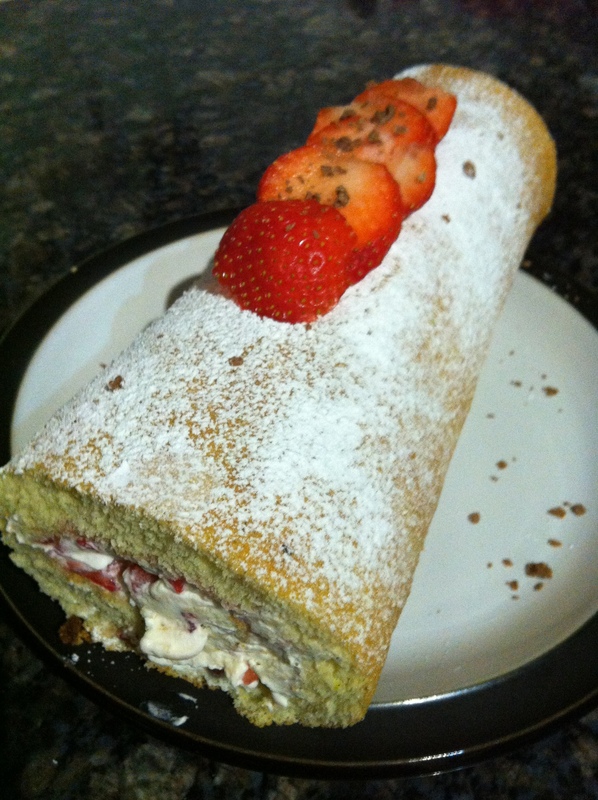 Spread the cream all over the sponge, leaving a small margin so it does not squelch out when it is rolled. Spoon the strawberries over the mascarpone filling and drizzle with a third of the strawberry purée (reserve the rest). Carefully lift onto a serving plate after it has been rolled. Sprinkle with some chocolate shavings and decorate with extra sliced berries. Ricotta Pie! I really do have to stop baking… I’m using all my moms eggs up! !